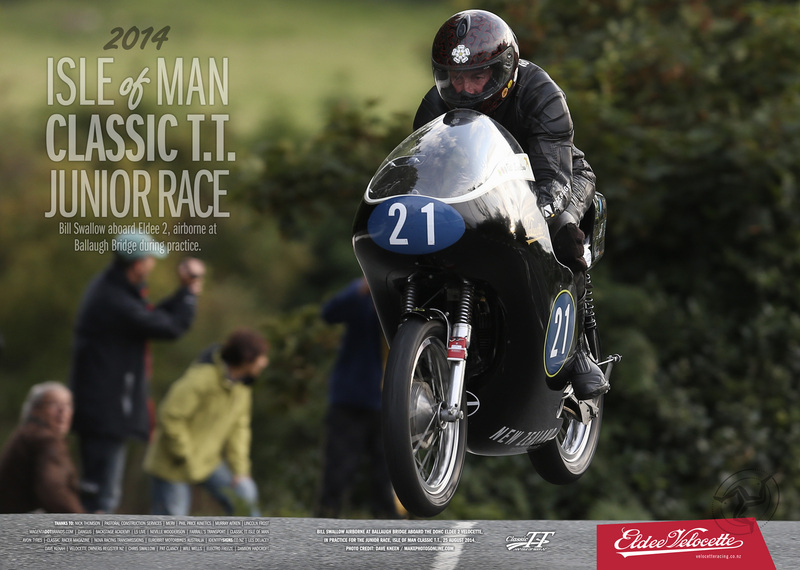 Feature Image: Isle of Man Classic T.T. Junior Race. Bill Swallow rounds The Bungalow during practice. Photo Credit: Russell Lee/Sport-pics. Written by Nick Thomson, November 2014. I DELIVERED ELDEE-2’s new aluminium crate to Lucas Palmer at Auckland Airport with assistance from Ken Macintosh a few weeks before the Manx. At 280 kg, it was packed with all the tools and spares we could think of including the original Eldee 2 motor. 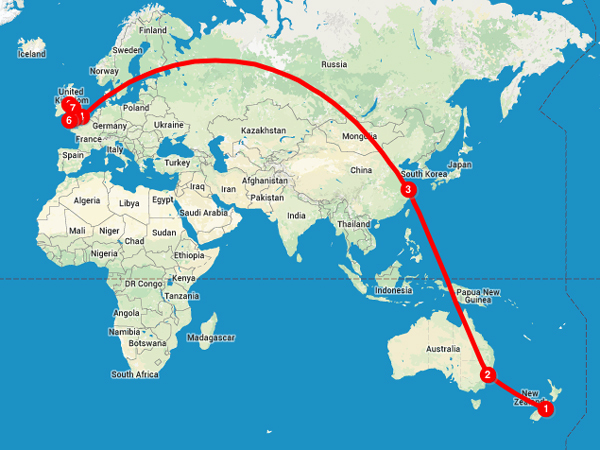 It took 36 hours to get to the U.K. where it was received by Andy Farrow who kindly delivered it to a depot in Somerset where Velocette Owners Club member Will Wells picked it up. Two weeks before the Manx Classic T.T., Phil Price and I followed via Shanghai to Heathrow, where Will and our friend from many years before Pat Clancy were there to meet us. Just 10 minutes before we came through arrivals, Pat was astounded to see a bloke wearing an Eldee 2 T-shirt come through—it turned out to be Phil’s brother-in-law, returning from New Zealand! You can imagine Pat was pretty excited by the time we appeared. We drove down to Will’s place in Somerset, and loaded the crate into Pat’s Transit van—just half an inch clearance! 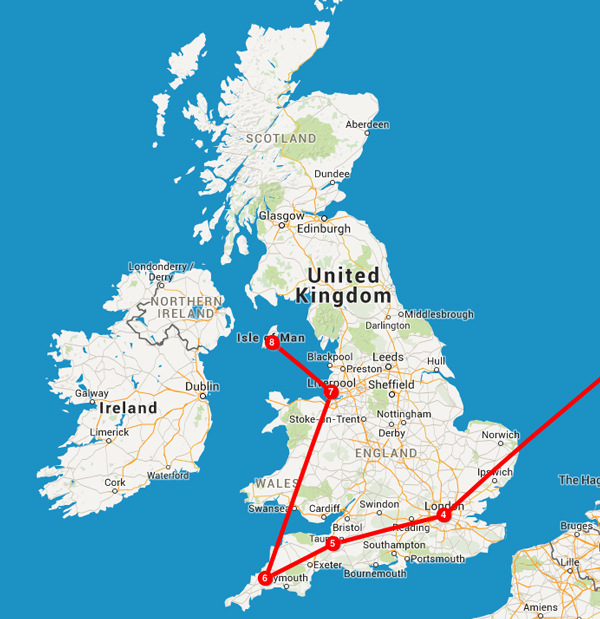 Then onto Pat’s house in Cornwall, arriving after midnight. We spent a delightful few days there, going over the Eldee and making some last-minute mods, including lengthening the inlet port, and in particular, replacing the followers with new roller-type and cams to match which I had brought with me. This was to alleviate wear which I was concerned about. Pat took the Eldee for a gallop on a few quiet local roads, in order to check the mixture on the air-fuel meter, with inconclusive results. But the bike sounded magnificent. So with the Eldee and Pat’s Venom Clubman in his van, we set off for Liverpool, with Will riding his Venom. Arriving in good time, (though Will’s bike with a puncture) we caught up with Tony Rodick from Nelson, another of Pat’s mates, who joined our party on the Ferry. Arriving in Douglas after midnight, we were met by local V.O.C. members Billy and Jim who had kindly let their beachfront cottage in Peel to us for the duration. And they had even bought a trailer for Will’s stricken bike! We couldn’t been luckier with the cottage and its associated garage which the Eldee shared with, of all things, Jim’s Maserati! Jim was to prove invaluable with workshop facilities, local advice and general assistance. The first priority was to test the Eldee in local conditions with the fuel we picked up from Steve Lindell who kindly organised this. We had our suspicions about the local fuel from stories the previous year, and in view of the importance of getting carburettion right, we had fitted an air-fuel mixture meter. Nick Thompson selects a change of jet during the race-prep dyno session. This seems to indicate stubbornly rich however, and, unable to source G.P. needle jets locally we sent an order to Amal. Nothing that we tried, however, seemed to improve matters, if anything the motor was running worse. The breakthrough came when Carburettor Guru Dave Kenah offered to accompany us on one of our test sessions. He spotted the air-jet was a methanol one, left in after some confusion with dyno testing back in Wellington. It was a good reminder to always check everything, and never rely on memory. After this, rider Bill Swallow pronounced the bike eminently rideable, which was a huge relief to us all. Les Diener in the pits with his racing Velocette 250 MOV in the 50s. At this stage we had been joined by Damion Hadcroft, Les Diener’s grandson, who is resident in the U.K.. He arrived in Peel on a single-geared bicycle with huge backpack, and no record of where we were staying. He was very pleased to hear his name called out as he cycled past our door! The project meant a huge amount to him, as he had assisted his grandad with the Eldee as a schoolboy in the 70s. Our activities in the garage had generated much interest, with both local and international Velo owners calling by. The I.O.M. Velo owners club had organised a rally at Ginger Hall during the Manx, and Phil was able to take the original Eldee 2 motor for display, and sell not a few T-shirts. And so to our first practice day, the Saturday. Bikes are scrutineered just prior to practice which means a real panic if things are not as they should be. Aside from adjustment to the steering damper, the bike sailed through, which was a great relief, since I had built-up a long list of potential problems in my mind. Having Bill hovering over the bike during scrutineering probably helped! Final race-prep in Nick’s workshop, Phil and Nick evaluate the fit of the faring. We had been very generously offered room in the Works Norton Tent by Richard Adams whose 500 Manx Bill was also riding, where the Eldee attracted much attention and I must say it looked superb, with Phil’s beautiful black fairing, seat and tank. I daresay it had been sometime since a 250 Velo fronted up to a Manx. Well, due to a shortage of marshalls, a perennial problem at the start of the Manx, practice for Saturday was cancelled, and we were back again for Monday’s session. 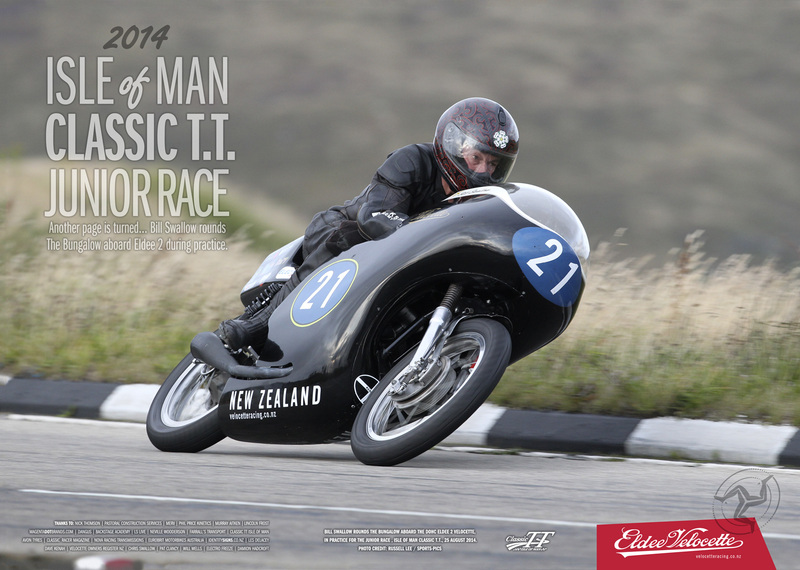 With nothing else to do, we were free to watch the 500 Manx classic on the Saturday. It was a real thrill to watch Bruce Anstey come home third on the Macintosh Manx, since we had witnessed its demise the previous year. But a catastrophe for Chris Swallow on Dave’s Manx Norton, with clutch failure on the first lap, especially after setting the fastest time through the Highland speed trap for a 500 single, at 136 mph. He was a real contender for a podium finish. And so, for the first time, Eldee 2 took off around the Isle of Man circuit. Talk about a thrill, hearing it accelerating away down Brayhill. Then nothing to do but wait for around 26 minutes, and then there he was, back in pit lane! The bike had completed its first lap without incident. We gathered from the reaction of several I.O.M. stalwarts that this was a major achievement.Bill himself was very pleased. Apart perhaps from the horsepower, he said that he “wouldn’t want to change a thing”, and this we gather coming from Bill, is high praise indeed. He particularly liked the suspension, handling, brakes, clutch and gearbox and the tucked-in riding position behind the fairing. Very satisfying to have all our hard work vindicated.The next day was spent thoroughly checking over the bike, and in consultation with Bill, dropped the gearing a tooth, and reverted to standard Norton front dampers. An area of concern was the accuracy of that Scitsu rev-counter which was not the correct type for a magneto. We had been unable to obtain the correct one, and the needle was wavering at peak revs. Scitsu meter and Air/Fuel meter detail, Dyno session. And by this time the air-fuel meter had gone on strike, perhaps exacerbated by running too rich during testing. So I removed it, happy now that we were clearly in the zone with carburettion. 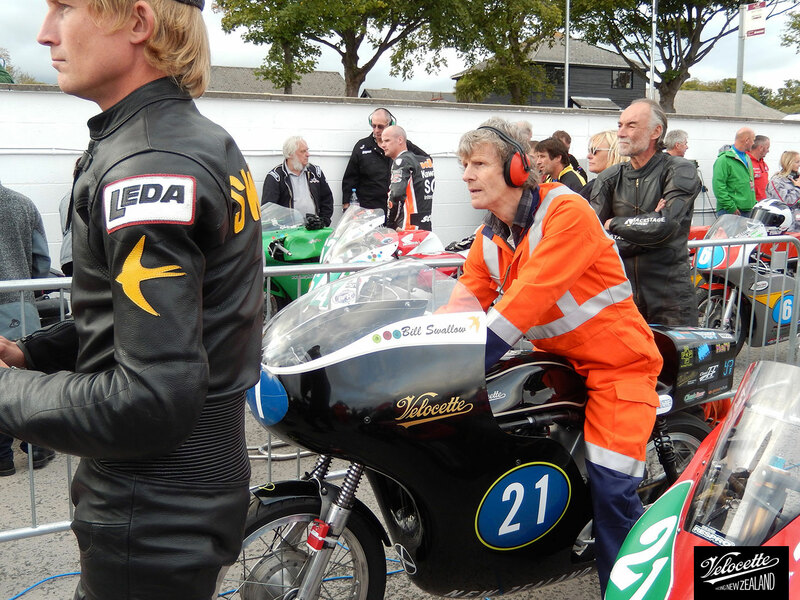 Practice sessions were for one hour, during which it was possible to take out two bikes, so Bill elected to do the first lap on the 500 Manx, and the second on the Eldee. He appeared a little concerned after the first lap, saying wind up on the mountain was blowing him right across the road. Sot it was with some trepidation that Phil and I waited in the grandstand as Bill set off on the Eldee, especially as the cold wind was now much stronger, and the spots of rain started to fall from darkening clouds. By the time Bill returned we were frozen, but Bill was all smiles and warm as toast behind the all enveloping fairing. And he reported no problems with the wind, which some nay-sayers had warned us of. We learned that a qualifying lap needed to be above 76mph, but Bill had done 82mph. So another milestone had been achieved. Nick adjusts the magneto during race-prep. But in reality, we were hoping to get into the 90s so some soul-searching was done. About all we could change was the magneto, a twin-spark Morris Mag, so we substituted for a single spark BTH of known provenance, and adjusted the timing down from 26 to 33°. In fact following suggestions, we did test runs from 26 to 40° with, astoundingly, very little to choose between them. But we settled on 38° (standard MOV!) since Bill felt that the motor seemed smoothest there. So through the ritual of scrutineering for the fourth time, and Bill was away again. But this time a different story—the bike petered out at Ballaugh Bridge about half way round. And it was here we collected in the bike, as darkness fell—fortunately local supporters had looked after Bill in the pub for the duration. Clearly the original Morris Mag was not to blame, so we changed back. But we had a sense that something was not as it should be. Our friend John Anderson had arrived by now, and with an engine simulation package on his laptop. And so we set him to work straight away crunching numbers, something at which Damion proved to excel also. The upshot was that most of what we had done was correct, though peak power was perhaps at higher revs then we suspected we were achieving. Even so, we elected to shorten the exhaust header. And a local garage lent us their MIG welder to enable us to re-mount the exhaust system. Chris Swallow, Nick Thompson, Bill Swallow and the Eldee 2 on hold in Pit Lane. 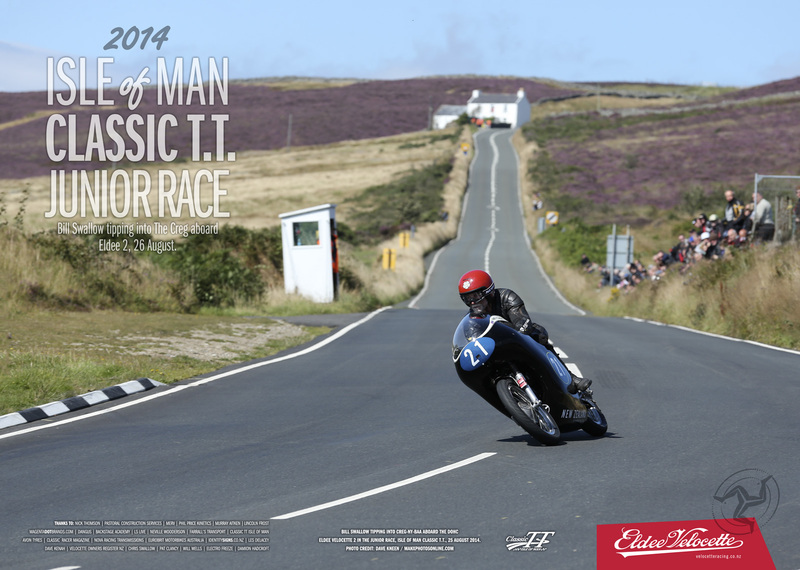 And so to our race, the junior Manx Classic, combining 350s and 250s. Scheduled for Monday, fog on the mountain meant a postponement to Tuesday, since if the rescue helicopter can’t land the race can’t be run. So with a carefully calculated fuel load, I push-started Bill on the dummy grid. At number 21, he started 210 seconds behind the first bike. Eldee 2 sounded glorious as it accelerated off through the gears down Brayhill. You would not imagine any Velo could sound like that, roaring away at seemingly impossible revs. However all was not well, as Bill said later the bike seemed to hesitate at times, and slowed a little over the mountain, whereas in practice it had flown up the mountain in 5th gear at 8000 RPM. But on the way down, with gravity assist and slightly lower gearing on what is probably the fastest part of the course from Creg-ny-ba, Bill said he found himself going “really quite quickly indeed” instead he had to “think about this corner” as he approached Brandish. Through the start finish, it was obvious the lap was slower than in practice, which was a worry, and then eventually the leaderboard showed him as retired, part way round the second lap at Ballacraine. The cause was found to be stripped alloy Magneto gear, possibly weakened by seizure of the timer breather on the dyno back home. This was part of a long saga during testing of the bike before we left. 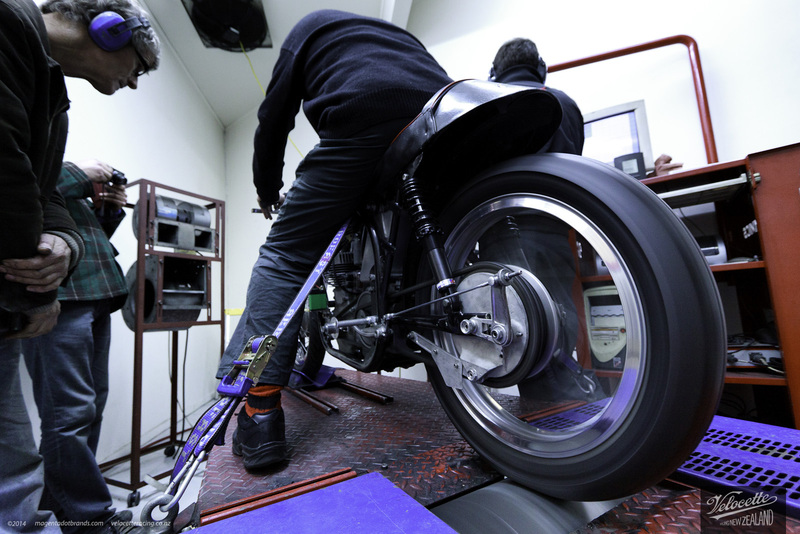 Dave Angus astride the Eldee Velocette race prep Dyno testing at Motomart. Knowing the revs at which it would need to run, I was very keen on the magneto turning at quarter engine speed by using a toothed belt in the timing case. This appeared to work well during the test session at Manfield, but in fact the belt broke down, possibly due to temperature. The upshot was a serious wet sumping and a badly damaged piston and liner. With these replaced, and time running short, I reverted to gear drive for the now modified Magneto, but with the changed centre distance, the timed breather didn’t match, and hence seized on our next dyno session. Obviously a steel mag gear would have been preferable. However this was not the only problem, because when pushing the bike back through the pits when it was returned, it became obvious that the back wheel was stiff to turn, and this may have been happening for some time once it got hot. Once properly cold it appeared perfectly free. We haven’t yet got the chance to properly investigate, but suspect it will be bearing spacing. Les Diener aboard the Eldee Velocette in the 50s. 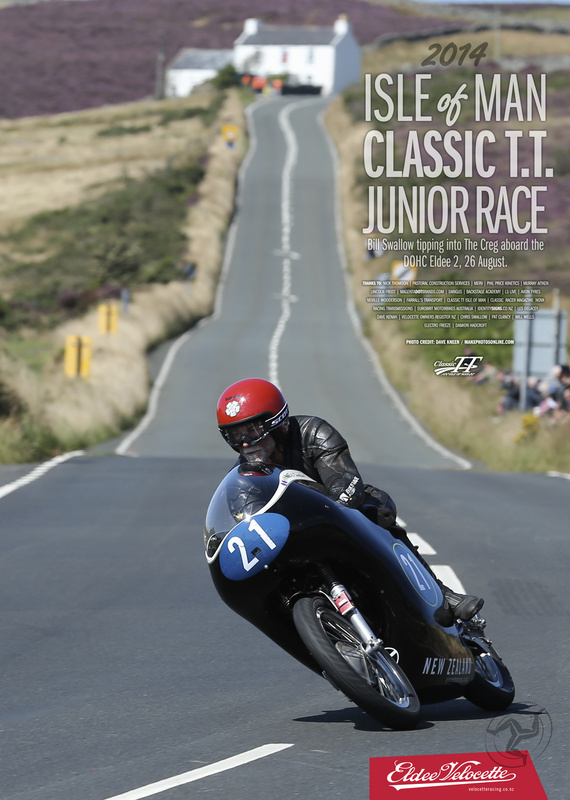 So although on the face of it a disappointing result, especially for Bill with a D.N.F in the 500 Manx classic also, we were by no means all doom and gloom. The plan had always been to take the DOHC Eldee 2 to the Isle of Man, in as close original condition as Les Diener might have done. In view of the arduous nature of the Isle of Man course, where 250s are on full throttle for most of the time, it was felt that a more bullet-proof replica motor was essential. And this largely lived up to expectation. And when one considers that the fastest 350 Velo in the 1953 Manx averaged 78 mph, we feel our wee Velo didn’t do too badly. But we are certain that there is more to come. At the event in August we had the privilege of meeting Ron Herring, a retired engine analysis consultant, who very generously ran our motor through his engine analysis simulator. He has supplied us with new cam profiles, which I have already made and am waiting to fit when we get the bike arrives back. 1954 MOV line drawing: Velocette Owners Club U.K.
Footnote  The DOHC innovation was originally crafted in the early 50s by gifted engineer and champion Australian racer, Les Diener, from whose initials the ‘Eldee’ takes it’s name. In 2014 Nick Thomson has, among other things, completely recreated the DOHC drivetrain and housing.